Nuxe Nuxellence Jeunesse. Just twist it. If you are pretty new to Nuxe brand, its actually a famous brand in the UK that have arrive Malaysia for quite sometimes. Famous for their Nuxe Huile Prodieguese Dry Oil. I receive this from Sasa Malaysia to try it out, I give this a try for a week. But before that, let me give you an intro of this product features. Main Ingredient : Natural Origin Extracts such as Passionflower, Anchusa, Poppy, Hyaluronic Acid, Calendula Petals, Galanga. Why is the product is highlighted on the "re-charging" focus? The latest studies in the skin physiology have revealed that, day after day our cells de-charge themselves. So we need to produce more essential elements to the skin such as collagen, elastin, GAGs and etc to keep our skin back youthful. This is some kind of an innovation to a product. Nuxellence is not a moisturizer, you can use it together with your other face product. Its more of a fluid (extra supplement to the skin) This also claims to be after a several years of research, the laboratory identified 3 flower extracts and demonstrated their activity on the repair of Mitochondrial DNA. Why is Mitochondrial DNA key to skin aging? Basicly, the Mitochondrial DNA is 10 times more vulnerable than the nucleus DNA. It is not protected. So when it is not protected it can cause skin aging faster. With the benefits of this fluid, it protects and kinda give it a "power" to energize and re charge you skin. Wow, so many since terms here! Use the Nuxellence fluid with 1-2 pumps on your hand and rub it in your palms and apply it on the entire face. You can use it day and night. for all ages and women with normal skin and combination or use it under your cream to pamper your dry skin. For the scent, I love the scent. It really reminds me and makes me feel all of this dedicated exotic names flowers are on my skin. The delicate fragrance is infused with subtle Linseed Flower, Lily of the Valley, Heliotrope, Mandarin and Nectarine notes. The texture of this fluid is light weight creamy. Easy to spread out and the absorption is okay to me. It claims to be a velvety and infinite soft feel. It is paraben-free and contains 87% ingredients of natural origin. The packaging is pretty cool. You kinda need to twist it to the left be able to get the pump out. 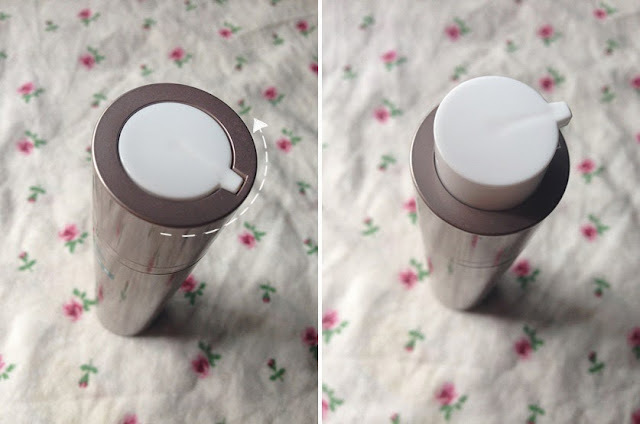 The bottle is made out of a sturdy plastic with a bronzy bottle color. The pump serve no mess, 1 pump is perfectly distribute the exact amount you may need. It promise of its safety and effectiveness is that all selection of ingredient are natural, product without minerals oils, without coloring agent and without animal origin except for bee hive. So no worries to my Muslimah reader. It is safe and halal to use. Non-comedogenic products. Test is carried out by an independent Laboratory and approved by the French Ministry of Research. Contribution to the environment. It is the No 1 Selling Nuxe Anti-Aging product in France since its introduction to the market in 2012 not in UK. My thoughts on is that this fluid is that is a good additional to my skincare routine. I tried to practice myself using this and apply this to my neck too. I need to start using anti aging stuff from now on! hehe. You know i am a fan of fast absorption cream, this does not absorb fast but it feels soft after applying it. I love the fresh scent to it. the significant changes that I can see is that my skin feels a lil elastic than before. Thats all. I heard alot of good review to the other bloggers who have been using this for months. I should give it a try longer. Exclusive at Sasa Malaysia outlets. sab, oily tak??? macam best je! absorption dia xkuat sgt.. so maybe akan rasa lembab sikit kulit which is good tp rasanya ok. maybe xmeyebabkan kulit lg berminyak. :) maybe leh layer kan ngan everyday powder to set it. The packaging looks fab and very hygienic! Haven't started on anti-aging products.. hahaha. Maybe I should.